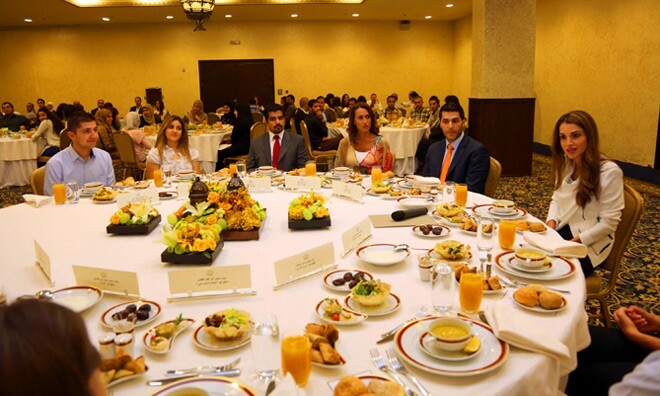 (Office of Her Majesty, Press Department-Amman) Her Majesty Queen Rania Al Abdullah hosted today a group of youth volunteers from different initiatives and organizations for iftar at Al Hussein Youth City in Amman. Working across the kingdom, the volunteers come from different organizations that cater towards a wide array of causes and issues such as poverty alleviation, community development projects, health and environmental awareness, assisting the elderly and education. “You have the positive outlook to find solutions, and I encourage you to continue to do so,” Her Majesty told the volunteers. “You are pioneers in spreading the culture of volunteerism”. Her Majesty commended the volunteers’ giving spirit and their commitment towards helping the less fortunate and expressed her pride in the fact that these initiatives were founded and organized by the youth themselves. The Queen also stressed the youths’ ability to bring about positive change and the need to encourage further systematic and inclusive volunteerism efforts, to encourage more participation by Jordanian Youth.